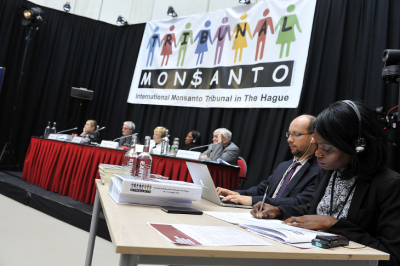 Today, judges delivered their legal opinion on the evidence and witness statements presented at the Monsanto Tribunal that was held in The Hague (NL) in October 2016. During the hearings that took place in The Hague in October 2016, judges heard testimonies from witnesses from all over the world, who testified how Monsanto has violated human rights and has committed crimes against the planet by aggressively promoting its products, lobbying politicians and attacking independent scientists. Based on these testimonies, and considering both existing international law and ongoing legal initiatives aiming to improve the protection of human rights and the environment, the judges concluded that Monsanto has indeed infringed on the public’s rights to food, health, a healthy environment and the freedom indispensable for independent scientific research. “international law should now precisely and clearly assert the protection of the environment and the crime of ecocide”. If such a crime of ecocide would be recognized in international criminal law, “the activities of Monsanto could possibly constitute a crime of ecocide”, the judges stated. In their final conclusion, the judges highlighted the current imbalance in the international system, which offers much better protection to corporations and their financial interests (through trade and investment law including ISDS courts) than it does to human rights and the environment. It is now crucial for the UN to act on this widening gap, they warned, as “otherwise key questions will be resolved by private tribunals operating entirely outside the UN framework”. The verdict of the Monsanto Tribunal has our fullest support. Its legal opinion makes it crystal clear that corporations like Monsanto violate our right to live in a healthy environment and how they get around the international laws meant to protect people and planet. “With the current wave of mega-mergers in the agribusiness sector, the biggest pesticide producers are becoming even more powerful. But so is our call to regulate them!